Jessica Welch helps her son Kaden with his homework as her daughter Keja draws inside their home provided by Eveline's Sunshine Cottage in Amarillo, Texas. AMARILLO, Texas—Last Tuesday afternoon, 25-year-old Jessica Welch escorted her three young children into her well-appointed, four-bedroom duplex. Family pictures and a constellation of crucifixes adorned the walls; a colorful homemade quilt hung over the sofa. Her two daughters, 9 and 4, started bickering over Christmas candy, while her son, a first-grader, quietly started homework in a loose-leaf binder. Periodically, the kids would run outside and shout out to a few other children across the yard. Welch earned her associate’s degree in nursing in 2011, so she works two days a week as an RN at the local hospital while the kids are in school. Every night is pretty much the same: After Welch puts her kids to bed, she makes her way over to the desk in the corner, where she studies to finish her Bachelor’s of Science in nursing online at Texas Woman’s University. A few years ago, this scene of peaceful domesticity was unimaginable. Welch was living in public housing and seldom let her kids play outside because people sold drugs outside her door. Twice a teenage mom, she couldn’t imagine fulfilling her dream of becoming a nurse, so she had settled for working as a Certified Nurse Assistant for $7.50 an hour. But that all changed in November 2007, when she applied to be a resident in Eveline’s Sunshine Cottage, a nonprofit program in Amarillo, Texas for single, low-income moms who are serious about getting their education. At Sunshine, women and their children live in apartments usually subsidized by the U.S. Department of Housing or similar programs, and they must be enrolled in 12 credits or more, often at Amarillo College a few blocks away, and maintain a good average. No drugs or alcohol are allowed, and absolutely no men. It’s a serious commitment, but the rewards are rich: a degree, a safe place to live, role models and childcare, and a community that has your back. Eveline’s Sunshine Cottage is a small, intimate example of a relatively new approach for ending the cycle of poverty, in which 16 million American children live: two-generation educational solutions, where the focus is on both parents and children. Cottage resident Sheneka Collins in her home. She is pursuing a degree in education with the goal of becoming a principal. This idea can take many forms, like pairing early childhood education with career advancement classes for adults, or getting parents more involved in their child’s Head Start program. But a particularly hands-on approach is a residence like the Cottage—which not only allows a mother to pursue an education, but provides a built-in support system for her entire family. The Cottage connects families to two daycare centers within walking distance, helps with Head Start applications, and works with an organization called HIPPY, a free, in-home instructional program for parents of preschool-aged children. Texas has one of the highest teen pregnancy rates in the nation, even as the state’s funding for families has gone down. Since the sequester has taken effect, thousands of low-income children in Texas have lost access to childcare, and the state lost about $2,263,000 in funding for job search assistance. So it’s up to people like Eveline Rivers, founder and director of the program in Amarillo, to fill that gap. But Rivers didn’t set out to replicate national trends toward two-generation solutions. In fact, the Cottage emerged rather organically. Rivers had been organizing her longstanding “Christmas project,” which provides presents to low-income children in the area. Year after year, she saw the names of the same single moms. “I thought, ‘we’re just putting a Band-Aid over the problem,” said Rivers. A more longterm solution, she reasoned, would be to figure out how to help the women get educated. One October night in 1999, she got wind of a small apartment building for sale three blocks away from Amarillo College, and she had the idea for Eveline’s Sunshine Cottage. 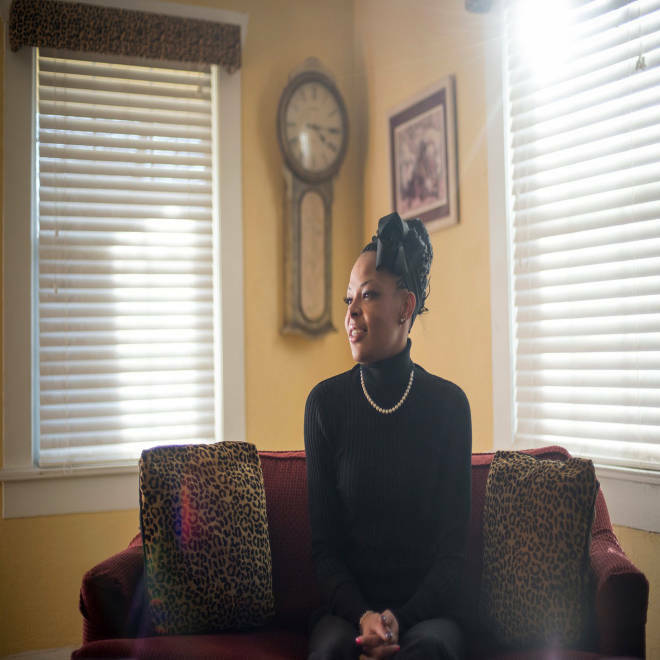 She established it as a nonprofit with the help of an attorney friend, and started writing grants. To her surprise, the money—from foundations, individuals, and local businesses—poured in. In 2001, she moved her first families in, and in the years that followed, the nonprofit bought two more buildings on the same street. The Sunshine Cottage now has capacity for nine families. The community, which Rivers refers to as “the sisterhood,” is tight-knit. They babysit for each other. They lend each other eggs and milk. They trade information about preschools and nursing clinics at the nearby college. The result is a sort of makeshift mirror image of the college dorm experience—only with diapers to change and mouths to feed. It was just Rivers and “the girls” that day, but sometimes she’ll invite Nancy Brent, the director of the Adult Students Program at Amarillo College, to help the mothers with class schedules, financial aid, and scholarship applications. Other times she brings a board member who offers budgeting advice to the women. Rivers’ community ties in Amarillo run deep, and she shares them with her girls. Her mechanic friend teaches the moms how to change tires. Her orthodontist friend has gifted a few with braces. 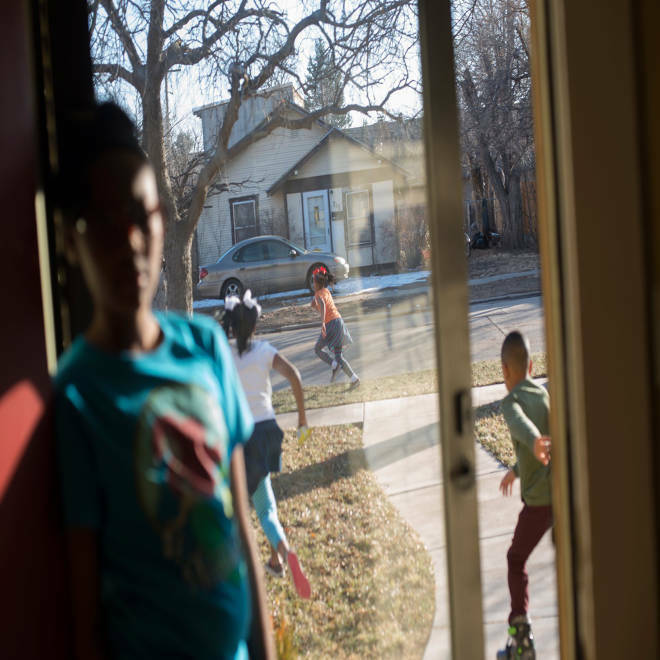 Sheneka Collins' children run outside to play near their home. And then there are the “cottages” themselves, furnished and decorated with donations from Amarillo residents. Having a comfortable home “just has a calming effect,” said Claudia Correa, who works fulltime in customer service at an energy company and goes to school fulltime for business management. Similar programs are trying to apply the two-generation solution idea nationally. The Jeremiah Program, which serves 77 families in the Twin Cities, is planning to double that capacity by building facilities currently underway in Austin, Tex. and Fargo, N.D.
“The idea of a campus community, about getting like-minded people to support each other…and breaking down that barrier of isolation—that can be done on a larger scale,” said Gloria Perez, president and CEO of the Jeremiah Program. Eveline's Sunshine Cottage founder Eveline Rivers (left) hugs resident Sheneka Collins. At Jeremiah, there’s an Eveline-like professional serving 18 moms at a time: a “life skill coach” who meets with them once a month to check on their progress. Jeremiah engages community volunteers, much like Rivers’ network of Amarillo professionals. The success stories make this idea attractive to deep-pocketed philanthropists: the Aspen Institute and the W.K. Kellogg Foundation each have given millions of dollars toward two-generation programs. And according to early research, this approach seems to be working: studies show that when parents continue their education, “the home environment becomes richer, it’s more cognitively stimulating, and it helps children learn,” said Lindsay Chase-Lansdale, a professor of human development and social policy at Northwestern University, who is developing a two-generation project of her own in Evanston, Ill. A report by Katherine Magnuson of the University of Wisconsin found that if mothers went back to school while their kids were still young, their children were less likely to drop out of high school or to become teen parents. Meanwhile, Eveline’s Sunshine Cottage has graduates who are thriving. Shannon Davidson entered the program in 2005, when she was 27 and had three kids, no job, no car, and no place to live. “We were really desperate,” she said. Once a ninth-grade dropout, she stayed at the Cottage for five years and got her associate’s degree. She now makes $25 an hour working fulltime as an RN and recently bought a house in Amarillo. Her oldest son is about to graduate high school and wants to eventually attend the police academy. These successes reverberate beyond the nuclear family. Davidson inspired Welch to apply to the program. And Welch, in turn, referred another woman, Elsa Flores, whom she’d known since sixth grade. Welch now works at the same hospital where she delivered her three children, and sees teen moms like her all the time. Education coverage for NBCNews.com is supported by a grant from the Gates Foundation.